Buttons, zippers, snaps and buckles are all clothing fasteners that require finger dexterity and fine motor skills to open and close. Did you know that they also require gross motor skills? In order to be able to open and close traditional clothing fasteners one must have proper stability, postural control, balance and bilateral coordination. The proximal muscles of the shoulder girdle and trunk function as a stabilizer when fastening clothing. Efficient control of the larger muscle groups in the neck, shoulder and trunk is necessary to maintain stability in order to place the fingers and hands in the proper position to button/unbutton, zip/unzip, snap and buckle. When children are using clothing fasteners, they require distal control of the hands and fingers while the body must remain balanced. The head moves to visual track the skill (flexion and perhaps rotation) possibly eliciting an equilibrium reaction in the body to maintain an upright posture. Children must have intact equilibrium reactions and sufficient balance in sitting and standing to fasten the clothing. 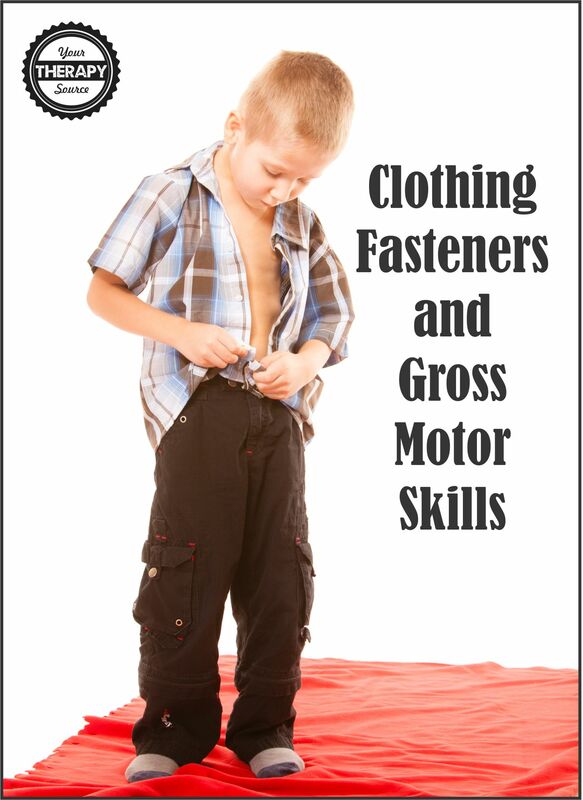 Bilateral coordination skills are a necessary skill for independence with clothing fasteners. Higher level bilateral coordination skills are needed since the opposite hands and arms are doing slightly different motions with different timing while fastening clothing. Unzipping or unbuttoning requires less bilateral coordination skills than zipping and buttoning. For example with zipping both sides of the body are doing different motions at the same time. In order to zip one must: use one hand to hold the bottom of zipper track, use the other hand to hold the zipper pull, inserts track into zipper pull, pull down the track to lock into place and finally use one hand to pull side of jacket down while other hand pulls zipper tab up to zip. Buttoning also requires a sufficient amount of bilateral coordination skills to complete the task. For example when buttoning on the right side of the shirt you must: hold button with right hand, hold edge of buttonhole with left hand turning underside of buttonhole, right hand pushes button through hole until it hits left thumb and the left hand pulls button through hole while right hand pulls hole over button. Eye hand coordination skills are essential to use clothing fasteners as well. Children need to be able to utilize visual input to help to control the hands to complete the skills independently. Hanging and climbing activities – Practice monkey bars, chins ups, pull ups or swing from the tree limbs to increase the muscle strength in the shoulder girdle muscles and hands. Climb the ladders and ropes on the playground to increase the muscle strength in the shoulder girdle muscles, to improve eye hand coordination skills and to improve bilateral coordination skills. Pushing and pulling activities – pull a heavy wagon or push a child on a swing. These pushing and pulling motions help the shoulder learn to coactivate to produce the right amount of force and stability when using clothing fasteners. Push too hard and you will not be able to engage a zipper or fasten a button. Pull too hard and the button will be trapped inside the opening. Yoga Poses – provide muscle strengthening and postural control. Bilateral coordination activities where one hand is stabilizing while the other hand is moving – activities such as using a fishing rod, using a hand mixer, stirring ingredient in a recipe, hammering a golf tee into Styrofoam, etc. Overall symmetrical bilateral coordination activities (both sides of the body are doing the same thing as the same time) such as jumping jacks, jumping rope, dribbling a ball with both hands at the same time, etc. Overall asymmetrical bilateral coordination activities (both sides of the body are doing different things at the same time) such as cross crawls, windmills and hand clapping games. Games or activities that require the forearm to be in a neutral position such as tennis, badminton, zoom ball, throwing/passing a large ball with two hands overhead or opening/closing an expandable ball. Isometric exercises – activities such as Tai Chi and Karate require one to contract and stabilize muscles while the extremities perform various motions. Try this Ninja Clothes Pin activity to practice postural control, isometric exercises and fine motor skills. Balance activities – Perform activities that challenge balance and eye hand coordination skills at the same time. Can you sit on an exercise ball and play catch? Can you stand on a balance beam and play catch? Try catching smaller and smaller balls. Provide a stable base of support while they are fastening the clothing. For example, sit on a bench with feet firmly on the ground or sit on the floor in the corner of the room with back support. Provide verbal cues as necessary. Try to use the same wording on each step by step direction for consistency. As the child becomes more independent, reduce the verbal cues until they can be discontinued completely. Avoid certain fasteners – if a child does not have the strength in the shoulders or hands to snap try modifying the clothing with velcro or elastic. Use backward chaining if a child is having trouble with motor planning to complete all the steps to zip, button or snap. Backward chaining means that an adult provides assistance throughout several steps until the child can complete the last steps independently. Practice the skill in an isolated setting when not rushed. Once the child can complete the fastening tasks independently, practice the skills in different environments (i.e. bathroom versus bedroom) or with different types of clothing (i.e. tighter fitting versus looser fitting). Need to measure progress of a child’s ability to button or zip? Check out the Dressing Skills Rubrics packet. Looking for more information about the development of the functional skills of scissor use in childhood? Stop by to see what the other occupational therapists and physical therapists in the Functional Skills for Kids series have written. 6 Tips to Decrease Anxiety When Writing Trolls Pencil Challenges – Free!